Enjoy The View at Saratoga Lake's Waterfront Park! Looking for a great spot to picnic or kayak while you're visiting Saratoga? While most of the beaches are privately owned besides Brown's Beach, the Waterfront Park is a fantastic spot to enjoy the day on Saratoga Lake. This beautiful public space opened in July of 2015 after a number of years were spent brainstorming how to develop the four-acre parcel of land off Crescent Avenue. The lower level of parcel has been transformed into a sandy beach, perfect for enjoying a sunny day. 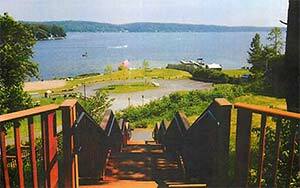 Above the beach on the middle tier, there is a small amphitheater that allows for community gathering and events overlooking Saratoga Lake. On the top tier, there is a parking lot and staircase that leads to both the amphitheater and beach area. As of summer 2015, there were no plans for swimming at the beachfront. What kind of activities can you do at the Waterfront Park? If you are coming from Saratoga, head east on Union Avenue and take a right on Crescent Avenue after Interlake. The park is approximately a half mile down on the left.